A great acoustic absorber, the product will help your employees work smarter – and harder – thanks to the immense comfort and design benefits of this handy laptop pedestal (it works really well with keyboards too). 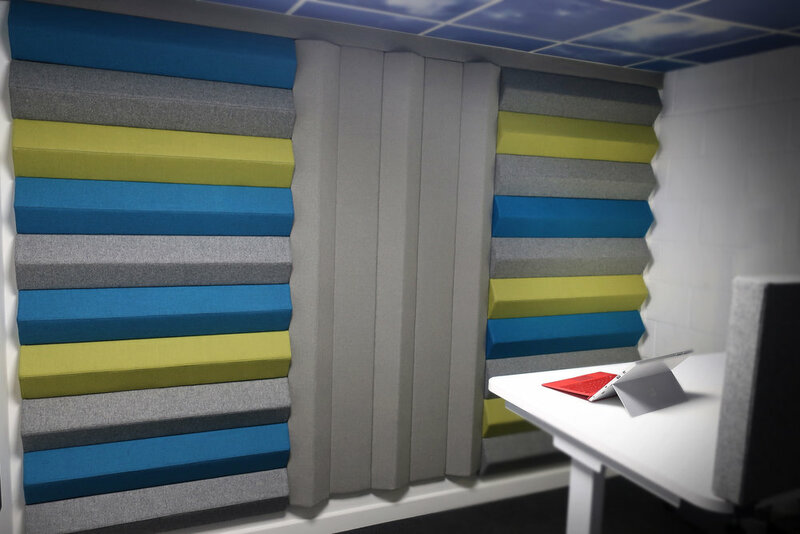 Helping to reduce the noise levels in your space, the product is the epitome of ‘agile working’. Take a look at our unique design below (Registered Design # 6054041). What is agile working, then? It’s basically a way of getting stuff done – in a smarter and more efficient way. In short, it allows an organisation to give its workforce the opportunity to work where, when and however they choose. Affording maximum flexibility, it ensures optimum efficiency, too – and who wouldn’t want that?! A fantastic addition for office CEOs who are keen to create a more agile working environment, the innovation allows employes to whip out their laptop and get comfy wherever they are. With pockets for cables, pens and whatever else you might need to hand, the elevated plinth is comfortable, practical and stylish, too. But did you expect anything less from the Agile Acoustics team?! Of course, the AgilePLINTH is available in a host of colours – upholstered in Abraham Moon wool in a scheme to complement your décor – meaning it’ll fit right in to any space. 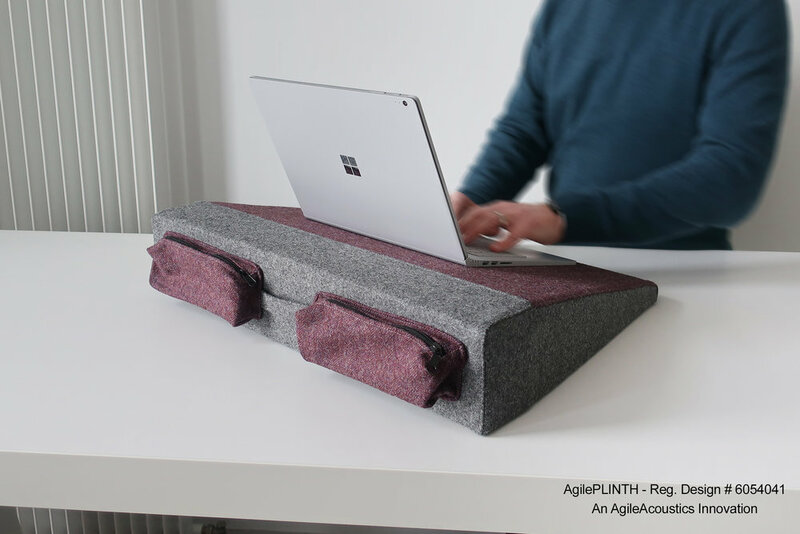 Light enough to be carried around the office with ease, the AgilePLINTH can be used on your lap, on a desk…on a train…wherever you like. We’ve made it so it works with you, not against you – and you’ll feel confident carrying it around, too. The ultimate work accessory, the innovation even looks the part when it’s not in use – and with a range of colourways and embroidery options on offer, it’ll blend into your décor with ease. Sleek and cleverly-made, the AgilePLINTH is yet another concept from our forward-thinking design team here at AgileAcoustics. It’s just one of our inventions in our ’50 Products in 50 Weeks’ challenge. Of course, we do New Year’s resolutions properly here at our HQ – and this is just one of many innovations still to come. Like this product? We think it’ll make a great addition to your space, as it allows for easy integration into your workplace and can be transported from office to boardroom with little fuss. It can even be used outside; the pockets mean you can keep all your important cables and USBs protected – and you can simply pick up the plinth and transport it to your next meeting or one-to-one. Keen to hear how we can create AgilePLINTHS for your office space? Get in touch with our team today to discuss your requirements. ’50 New Products in 50 weeks’: can we do it?! We don’t do New Year’s resolution’s by halves here at AgileAcoustics. It’s the reason we’ve set ourselves the ultimate challenge for 2019: create 50 new products in 50 weeks – and we’ve already launched the first one! Of course, you’ve got to start strong with any goal – but do you think we’ll get through the entire year without skipping a week? You’ll have to stay tuned here on our blog to find out. So, how did we come up with the idea to create 50 products in as little as 50 weeks? After a brainstorm here in the AgileAcoustics office, we just knew it made sense. We’re all about innovation here at our Bradford HQ, after all. We’re great at putting our heads together and devising new ideas, so why not put ourselves to task and do it more often? As we said earlier, our first product is already here. It’s our Agile Edison freestanding acoustic screen and we’re really proud to get it launched and kick off what will be a great year of innovations for AgileAcoustics. So, what is the Edison? Also known as the AgileSCREEN, the product takes its sub-name from one of the world’s most respected inventors – Thomas Edison. He was known for the phonograph and the motion picture camera, amongst other inventions, so we figured we just had to name our revolutionary new product after him. The screen itself offers something different for the workplace in that it’s completely unique to the ubiquitous flat panel screen. What’s more, it can be upholstered in a range of colours to suit your office interiors – and it offers Class A acoustic performance too. Well, would you expect anything less from an AgileAcoustics product? Want to follow our ’50 products in 50 weeks’ progress? We’re keen to launch one new product every week until Christmas 2019 – and we’d love you to join us for the ride; it’s certainly going to be an interesting one. We’ll be documenting the journey over on our brand-new Instagram page, so why not head over there and hit the ‘Follow’ button? You’ll see that we’ve already been adding some imagery and products, so there’s plenty to feast your eyes on. Christmas is Coming…But We’re Still Innovating! Most people start to wind down before Christmas, but not us! Here at Agile Acoustics, our own little elves are creating innovative new products to add to our range – and we think you’ll love our latest addition. Introducing…AgileSCREEN/Edison! 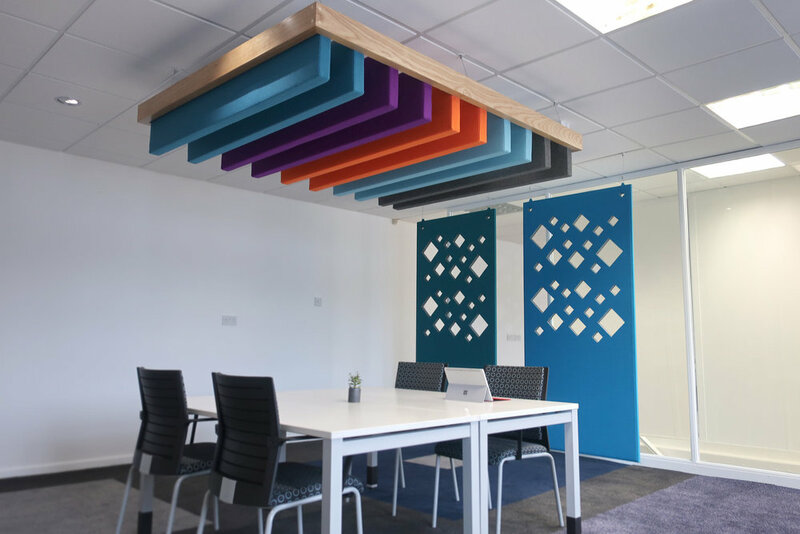 The freestanding acoustic screen has been designed with office spaces in mind, but we envisage this product being featured in all sorts of businesses. The product features a robust sub-frame with Triangle-profile AgileBAFFLES – the AgileBAFFLE being another of our innovations. Pictured here, a prototype of the model features wool from Abraham Moon (in Melton II Carnaby and Melton II Angel) – a striking colour combination, don’t you agree? A unique design, the freestanding acoustic screen has been named after Thomas Alva Edison – a notable American inventor. In fact, we’ll be sub-naming all our designs after world-famous innovators, paying homage to the great work they accomplished. So, who is Thomas Edison – and what is he known for? Described as America’s greatest inventor and businessman, he developed many devices in fields including electric power generation and motion pictures. The phonograph and the motion picture camera were two of his innovations, as well as the long-lasting, practical electrical light bulb. Such was his commitment to manufacturing that we wanted to pay tribute to him. Speaking about the AgileBAFFLE/Edison, our founder Stuart Jones said: “Edison offers something different in acoustic screens for the workplace. The design is completely unique to the ubiquitous flat screen, and because of the fascia profile, it will work a treat acoustically”. As with all our acoustic solutions, we can create this piece in any size or colour. Our bespoke office screen service means you can see your business kitted out with all manner of Edisons – in teal green, vivid orange or even hot pink! Registered Design pending. Our AgileBAFFLE product helps you improve the sound quality in your premises while adding a touch of style to it. It offers fantastic sound-absorption and can be incorporated into any business with ease. Again, it’s available in a variety of sizes, each of which can be customised to your space. Just click the link above to learn more about this exciting innovation from the AgileAcoustics team. This striking acoustic solution serves a purpose in office spaces while also looking great. Like our Edison version of the office screen, it can be manufactured in a host of colours, helping you to liven up a room in an instant. Looking for office acoustic screens for your space? Why not get in touch with our team today to discuss your unique requirements? We work across a host of sectors – from offices to schools and throughout the hospitality industry. You can take a look at some of our latest innovations here on our site, as well as check out some of our client installations via our Gallery Page. 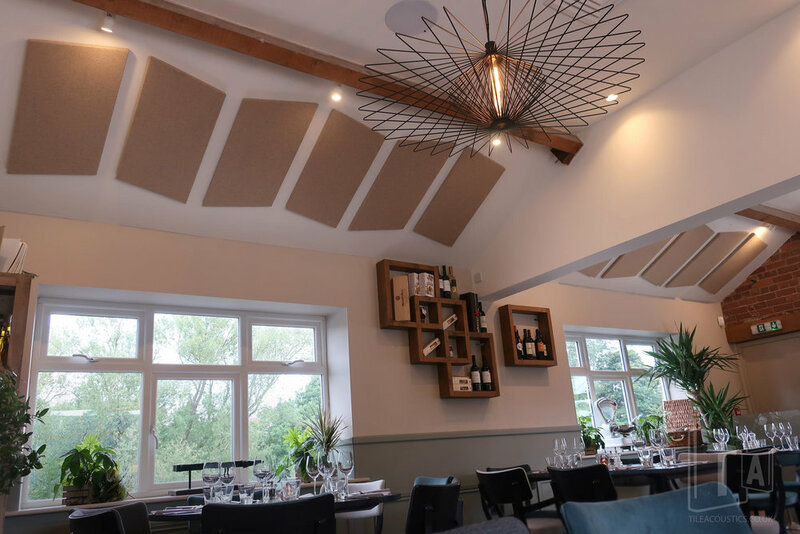 Restaurants and hotels are amongst our favourite projects to work on here at Agile Acoustics – and recently, we toasted an acoustic job well done at an Otley-based eaterie. Restaurateurs like Alessandro Tocca (from Italian restaurant Buon Apps) approach us fairly regularly. Often, they want to reduce the noise levels in their premises, without ompromising the aesthetics of their space – and who could blame them?! After all, when you’ve worked so hard to build up a customer base – which is due, in part, to the atmosphere you’ve created in your premises, why change? The good news is businesses who approach the team here at AgileAcoustics don’t need to make any drastically big changes to the way they operate – or the way their restaurant or bar looks. Alessandro from Buon Apps was one of many of our clients to be experiencing issues with sound quality in his premises. The venue is part of a converted mill complex on the bank of the River Wharfe and it’s a gorgeous space, which deserves to be frequented regularly by diners looking for a meal in a relaxed ambience. Buon Apps was crying out for an acoustic solution which looked great but was practical too. So, what did we come up with? We utilised specially-made Parallelogram tiles – and before long, we were presenting our ideas to Alessandro and the team. Of course, they loved it and we were soon installing the new acoustic solution. Alessandro was extremely happy with the solution we proposed and later put in place – and he’s relieved to now be working from a space that doesn’t just look great, it sounds it too! What did we do, then? During phase one of our project, we installed 20 of our specially-designed Parallelogram tiles, before introducing another 16 tiles to the restaurant once we started phase two. It was all stations go down at Alessandro’s restaurant – and the 50-mm thick tiles (as opposed to our standard 30mm-thick tiles) helped to provide extra absorption, while also ticking the ‘great design’ box that Alessandro was hoping our solution would tick! Think your restaurant could benefit from an acoustic transformation? Echo and reverberation due to the design and furnishings off a restaurant is still a big issue, with a 2016 Speak Easy Report by Action on Hearing Loss stating that nearly 80% of people have left a venue early due to the noise. But our practical solutions can – and do – help lots of businesses in the UK. Why not get in touch with the AgileAcoustics team to see how we can help?